You are at:Home»The Lifestyle»In Other Matters»Good Lord, is that…Galet? I know what you’re thinking, I’d need a pipe and a well-thumbed copy of Country Life and doze off in front of the golf on a Sunday if I wore a pair of these. But wait, these aren’t slippers, these are in fact the latest in a line of super-luxury loafers. What? Did you say ‘loafers’? As in the casual slip-on shoes commonly seen beneath open broadsheets in the smoking rooms of London members’ clubs or chipping their way down the King’s Road on a summer Sunday? But they don’t look anything like loafers?! Indeed, they don’t. That’s because these aren’t the stuffy stiff-sided shoes seen under every other English gents’ moleskins. No, sir. These brightly-coloured statements of haute couture are Galet loafers, handmade in an atelier in Paris and more likely to be seen slinking their way down the quayside in St Tropez than poised by the boundary rope on the village green. But cheap continental imports these most certainly are not. Their manufacture is taken most seriously even if their design may strain our stiff upper-lipped cynicism. Using traditional and time-honoured techniques Galet craftsmen create their shoes from leather, canvas and, for winter, pony hair. Yes, pony hair. The hair from ponies. Well, we did say they’re French. Conceptualised in January 2012, Galets are stylish modern shoes, perfect for the off-duty sportsman or yachting type – even those who purport to be. Ahem, guilty. Plain colours are all there if you’re a little more reticent but it’s the Sailboats and Starfish, Sharks and Rackets, and Fish and Kites that make these the more flamboyant gentleman’s accessory. Loud they may be in look but subtle in their wear; comfort is their MO with cushioned, rubber soles and soft uppers. Still think they’re slippers? 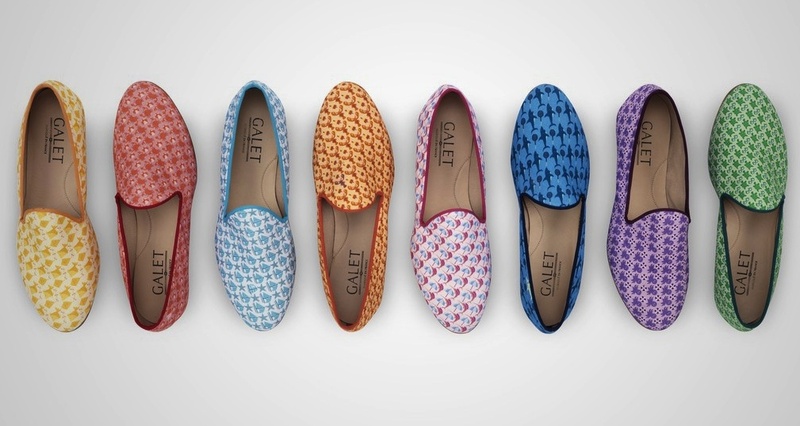 Since its official debut, Galet are now available in London, Paris, Los Angeles, Madrid, Mexico City, and the Maldives. And in the Spring/Summer of 2014, the brand will be available in – yes, London got there first – St Tropez, Cannes, Nice and Monaco as well as New York, The Hamptons, Palm Springs and Washington D.C. See? Even the Americans are game. Slippers indeed. If you didn’t believe me before, I bet you do now. Galet loafers are priced at £250 and are currently stocked at Wolf & Badger in-store and online from their website.